Machine learning as the application of Artificial Intelligence that has revolutionized the technology world. Cloud Computing field is not untouched by the significance of Machine Learning. 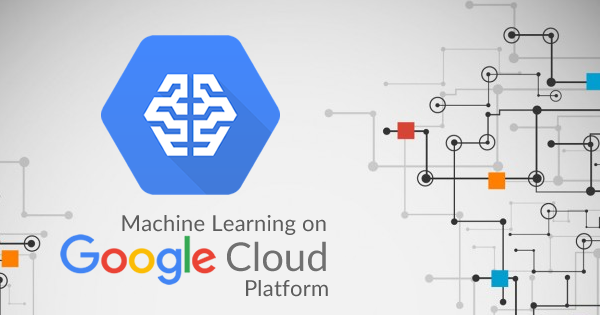 In this article, we will explore different aspects of Machine learning including Machine Learning on Google Cloud Platform and how to use Google Cloud Machine Learning. So, let’s begin with the basic introduction to Machine Learning. Machine Learning is a part of Computer Science. In Computer Science, Machine Learning comes under the AI (Artificial Intelligence) segment. It is defined as an application which can provide systems with a special feature i.e. the ability to learn. In Machine Learning, a Computer Program learns from experience. Machine Learning is based on three use cases. These are Binary Prediction, Category Prediction, and Value Prediction. 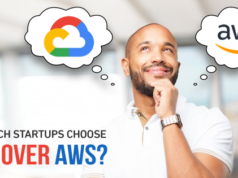 All the major Cloud providers (Amazon Web Services, Microsoft Azure, and Google Cloud Platform) support all these three use cases. Binary Prediction is used to evaluate data in a particular data. It is a yes or no use case. It is also used for processing and gathering data along with learning responses. Category Prediction is used to set data which is based upon gathered content. It is also used to analyze data. Insurance companies use this prediction in the real world. Whereas Value Prediction is used to get the results from learned and gathered information. It is also used to take a critical and important decision in enterprises and companies. There are many examples of Machine Learning in the real world such as Optical Character Recognition, Face Detection, Medical Diagnosis, Weather Prediction, and Email Filtering. Scientists are also working on Voice Detection for better results. Although Machine Learning was not cheap, It became cheaper when It entered into Cloud Systems. In terms of hardware and software, Machine learning systems were expensive. The machine learning talent and Cost of Systems were indirectly proportional to each other. If a company could afford machine learning talent, then it was not able to purchase machine learning systems. Similarly, if a company could afford machine learning systems, they had not required machine learning talent or data scientist. When the major cloud service providers like Amazon Web Services, Microsoft Azure, and Google Cloud entered into machine learning, the implementation of machine learning became easier for enterprise companies to afford. They also provided enough learning which was useful for beginners. All three major cloud service providers are different from each other in terms of machine learning systems. So they also have some advantages, limitations, and similarities. Let’s discuss a few advantages and limitation of Machine Learning Systems. Machine learning systems in the cloud are very cheap or affordable. You can build your own machine learning application easily in a few bucks. All the major cloud service providers allow embedding machine learning services using Application Program Interface(s) (APIs) and Software Developer Kits (SDKs). Machine Learning on Cloud supports all three use case predictions. So it is easy to operate and transact in any instance. It also provides an error-free resubmission at any time in any negative case. The data storage system is pretty bound on Cloud. Data Integration is a must in Machine Learning systems on the Cloud. It does not support enterprise database till data integration. More Enterprise attachment is not designed in the Cloud. There are ground-breaking changes arising in hardware and software that are equalizing machine learning (ML). Google Cloud Platform has a variety of products/tools for users for beginner and experts. For many years, Machine learning has been a foundation stone of Google’s internal systems. Google Machine Learning has provided a unique and deep understanding of the right frameworks, techniques, infrastructure, and data for our need for data-driven systems on a large scale to automate customer’s requirements. It also can help to achieve a successful journey. Google is providing a managed service that helps developers and scientists to create machine learning models. It is known as Google Cloud Machine Learning (ML) Engine. Google Cloud Machine Learning Engines consists of a workflow. There are a few stages in Machine Learning Work Flow. It is a high-level synopsis of the stages in a Machine Learning Workflow. Preparing for a Google Cloud Interview? Go through these Top 30 Google Cloud Interview Questions and get ready to ace the interview. Google Cloud Machine Learning has a few special features which make it more convenient and easier to design and manage. You can read all the special features below in detail. Integration: Google Cloud Machine Learning Engine is associated with Data Flow. It provides processing feature along with the cloud storage. In short, Google Cloud Services are created to work together. Training and Online Prediction Support in terms of Multiple Frameworks: Multiple Frameworks are used to train and predict models. Tensor Flow is used to understand deep learning. Classification and Clustering are also present in Multiple Frameworks. Automatic Resource Provisioning: If you don’t have the infrastructure in terms of hardware and software, yet you can deploy and develop Machine Learning Models. Automatic Resource Provisioning is dynamic provisioning in which a company provides a VPC which stands for Virtual Private Cloud. It is also used to predict future workloads. In this provisioning, the resources are acquired on demand. Server-Side Pre-processing: It is used to deploy pre-processing to Google Cloud. In this pre-processing, you can share data in the raw format to reduce local computation. It also supports Training and Prediction using pre-processing. Portable Models: By using Tensor Flow SDKs, you can train models locally. In fact, Other Machine Learning also supports the training module on some scale. There are few models like Tensor Flow, Keras, XGBoost and Scikit – learn. They also give real-time prediction hosting. HyperTune: After learning from thousands of experiences, to get advanced results, Google Cloud Machine Learning Engine use hyper-parameters with HyperTune. 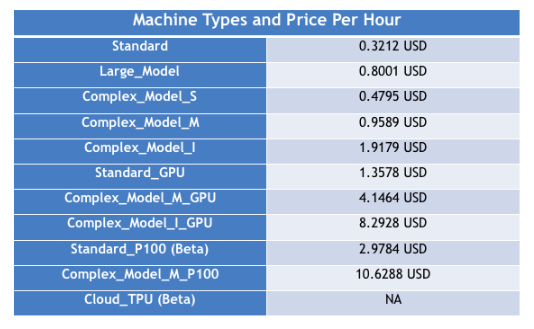 Google Cloud Machine Learning Pricing (In ASIA): Google Cloud Machine Learning Pricing consists of training modules and prediction models. *You can also use custom pricing in which you will have control over numbers. 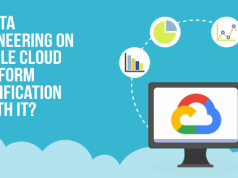 Improve Efficiency: If you are a manufacturing firm, then Google Cloud Machine Learning is the best tool for you to increase your productivity. Spam Detection: Spamming is a common problem in the computing world. Google Cloud Machine Learning has the ability to detect spamming. An easy way of Marketing and Sales: Recently Google Cloud Machine Learning team has provided users an assistant which is also called Google Assistant. It is used to make marketing calls. It also supports enterprise as a sales representative. Customer Segmentation and Accurate Predictions: Today the most faced problem with an enterprise company is Customer Segmentation. It assists different enterprise team by providing relevant data such as Website Visitors, Lead Generation data, and the result of Email Campaigns. Google has a Machine Learning crash course with TensorFlow APIs which contains 40+ exercises and 25 lessons. It takes 15 hours of duration. The lectures are providing by Google Researchers. It also contains real-world case – studies along with interactive visualizations of algorithms in action. You can also go to Google for Google (Cloud) Machine Learning Tutorials as well. It is free of cost with all the documents. Interested to adopt Google Cloud Platform for your business or build a successful career in GCP? Here are the top 10 GCP Facts that you should know in 2019. How to Use Google Cloud Machine Learning? At last, we will also brief how to use Google Cloud Machine Learning Engine. Follow the below-mentioned steps if you want to use Google Cloud Machine Learning. 1. Sign in to your Google Account with your existing credentials. 2. Create a Google Cloud Platform Project along with enabling your billing for the same. 3. Enable the Cloud Machine Learning Engine and Compute Engine APIs. 4. Set up the authentication part. Congratulations, you are using Google Cloud Machine Learning Engine. Google Cloud Machine Learning engine gives Google Cloud flexibility and power. Google Cloud ML engine can be used to train the machine learning models by using various GCP resources. Also, the trained model can be hosted on Google Cloud ML that enables the user to send prediction requests and manage jobs and models using GCP services. Machine Learning on Google Cloud Platform can bring a number of opportunities for GCP professionals. As an architect, one must be familiar with how to design serverless Machine Learning models. Having knowledge of Machine learning will also help you in your cloud architect career. 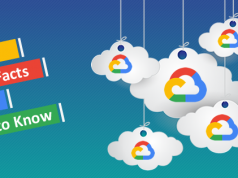 Getting Google Cloud Certified Professional Cloud Architect certification helps you validate your machine learning knowledge on Google Cloud Platform. At Whizlabs, we help you to give your cloud career a new edge with our Google Cloud Certified Cloud Architect Practice Tests. Have any questions or concerns? Just write in the comment section below or submit your query at Whizlabs Helpdesk, we’ll be happy to respond you.